Well since the last magazine we have had the Back to the Regiment Night and Anzac Day has passed for yet another year. At the Back to the Regiment night about 60 members attended entertained by the Band and by photos from the past. I hope that all members enjoyed the night and were able to catch up with people they had not seen for some time. Anzac Day was held at Sylvan Road once again. 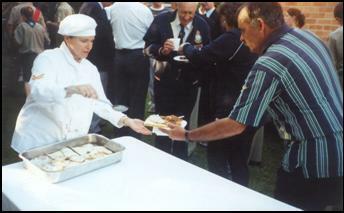 The Association provided breakfast once again for the unit and members of the Toowong Sub Branch of the RSL. 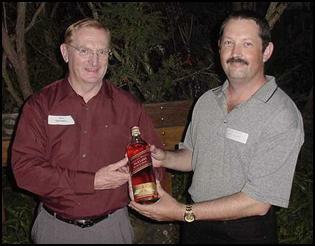 Other wise we have donated the prizes for the graduates of the unit in February 2002. We have finally been able to produce a history of the Regiment. Because of the costs of printing we decided not to publish it in the form of a book but A4 size. Additionally an electronic copy is stored at the Regiment and may be added to as time progresses. This means that every so often a new updated version of the history may be produced. To cover costs the history is on sale for $20 including postage. We have printed 250 copies. We have 128 left. (100 have been sold to the Regiment). I would encourage all members to purchase a copy. 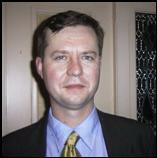 There is a full list of association members as at 2000 as an annex to the publication. 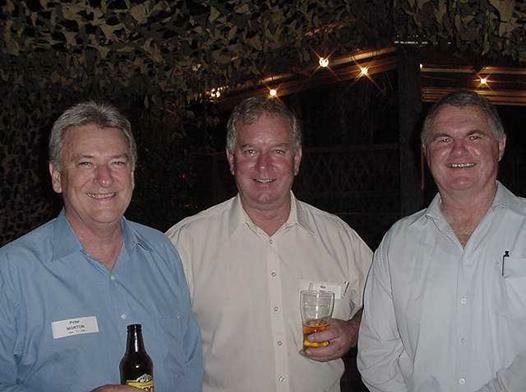 The next function for the year is the AGM on Friday 6 September 2002 at the United Service Club. I would ask members to consider whether they would like the honour of serving on the committee. The task is not overly onerous. I would also welcome Terry Gygar, (1965-1967 and 1973-1987), John Martin (1982-1988) and Paul Carr (1978-1984) as new members of the Association. As always contact me on pesb@ozemail.com.au with any suggestions. 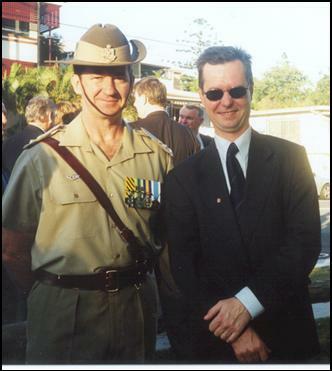 Commanding Officer, Lieutenant Colonel Peter Jeffrey, and Association President Paul Smith after the service on Anzac Day. Firstly, thank you to all Association members who supported the “Back to the Regiment” Night, ANZAC Day and the Regimental Dinner. All three were successes and I hope all involved enjoyed themselves. The RMC Bi-annual Conference saw the new Commandant, Brigadier Michael Paramour, put his personal stamp on the formation. The RMC formation is in good order and the direction only requires “tweaking”. The Regiment was most fortunate that the Commandant could attend and speak to the Regimental Dinner. He commented after the dinner on how he enjoyed the evening and the opportunity to speak to a number of ‘old’ friends. The Regiment continues to fight hard on all fronts for recruits and officer trainees. The more proactive approach to recruiting in ‘O’ week has seen marked improvement. Although, I had thought the numbers would have been better. Albeit, we have now encountered the next bottleneck in the enlistment process; medical and psychological testing. By the end of the year, the regiment will achieve its complete Net Training Liability of 45 staff cadets. July 2002 will be a busier period than usual. This year the Regiment will conduct the First Appointment Module 1A, the Officer of Cadets Officer Course and also the First Appointment Officer Induction Module A1. The latter will be an RMC formation course with approx 75 students, from across Australia, undertaking their very first two weeks of training. The Regiment will deploy the majority of its instructional capability to deliver professional courses. Scenes from the Anzac Day Gunfire Breakfast at the Walcott Street depot following the ceremony at Toowong. An egg with that, sir? 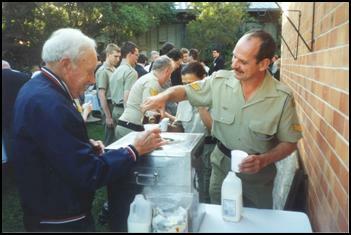 A corporal serves up a rum ration for an old digger. Major Stan Tredwell, former OC A Coy QUR, finally pays his debt to WO2 David Ross after nine years. 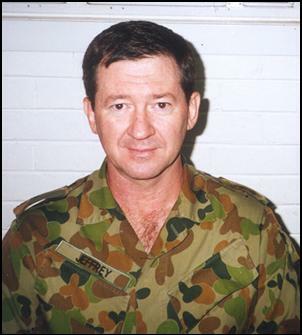 In 1993, after many years in A Coy, the then SGT Ross was told by the RSM that he was to go on the Subject One for WO Course at Canungra. Major Tredwell said that if his performance on the course was of a high standard he would be rewarded. As things turned out SGT Ross achieved the “Student of Merit” award for the course and Major Tredwell was so impressed that he promised a bottle of scotch as a fitting reward. However, the course of events that followed did not present an opportunity to pay the prize until this year’s back to the Regiment Night. 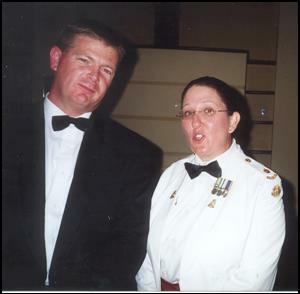 Wayne Robson and Gina Privitera at the recent Regimental Dinner. Gina has just completed a deployment to East Timor. 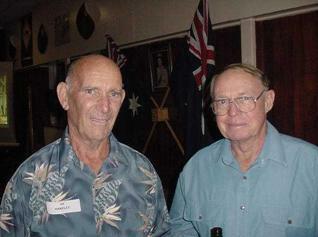 Former RSM Alf Handley and former Association President Neil Heather at the Back to the Regiment night. 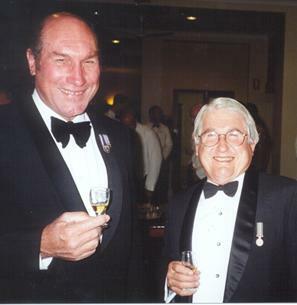 Rod Hardaker & Dave Sallows at the Regimental Dinner. 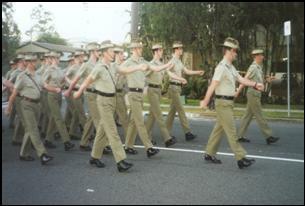 The Regiment marching down Sylvan Road Toowong prior to this year’s Anzac Day service. Please send me _________ copies of the Regimental History @ $20 per copy including postage.